Admit it: You’ve googled yourself before. It’s not narcissistic–you’re just curious, right? Who knows what’s out there in the wild world of the Web. Now, a new service is aiming to legitimize all your online vanities. Called About.me, the San Francisco-based startup allows users to register for their own personal homepage, and then pulls content from around the Internet to build a single online identity. So rather than having your profile scattered across myriad social networks such as Facebook or Twitter, About.me meshes it all together into one all-inclusive Web ID. 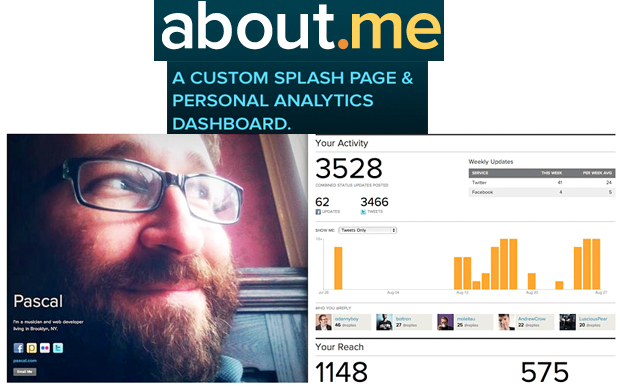 Most significantly, About.me providers members with a personal analytics dashboard to monitor their influence online. Users can track their total activity based on, say, tweets or Flickr uploads or Facebook status updates. According to TechCrunch, there will also be analytics on the “back end to help users understand how many people see your profile, where they’re coming from and what they do on your page.” And the site even provides a user’s “Reach” online, though it’s unclear as of yet how this number will be calculated. All these different identities will be represented on About.me, along with some helpful analytics to track where you’re influence stretches online. For those sharing a name with someone else who is perhaps more famous, this new service finally provides a solution to misplaced Web identities. Yes, it’s true, I’m not that Austin Carr. Head to About.me to reserve your name before it’s too late.